In my previous post, I discussed some steps for troubleshooting the connection from a new would be vCenter Server to a remote MS SQL Server. Because MS SQL servers can host multiple database instances, I added a second Named instance “Dynamic” to my SQL Server 2012. Start the SQL Server Configuration Manager. Go to SQL Server Network Configuration. Now we see our second instance named “Dynamic”. Note that the TCP/IP protocol is (again) enabled by default. Open the properties and switch to the “IP Addresses” tab. Setting up a vCenter Server with a remote MS SQL database is a common practice for environments other than very small, proof of concepts or labs. 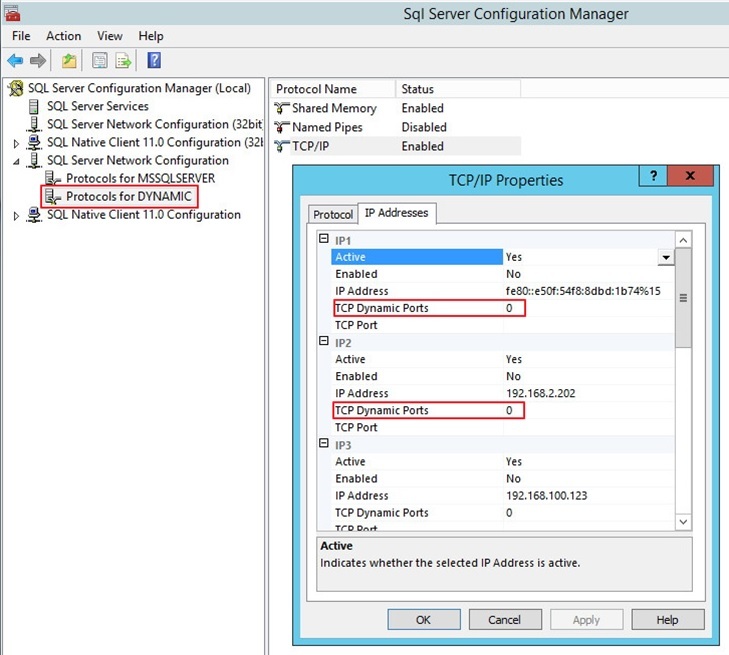 Chances are, you will face some difficulties setting up a remote connection from the new vCenter Server to the MS SQL server. In case the DBA is not around, this post presents a few points to help you setting up a remote connection to the database. In this example, I installed MS SQL 2012 on a Windows Server 2012 R2. You are currently browsing the Adventures in a Virtual World blog archives for February, 2014.